Mexican police are investigating a number of classified ads on the internet which purport to be from hitmen offering the services. The ads can be found alongside ones for private tuition or domestic help. 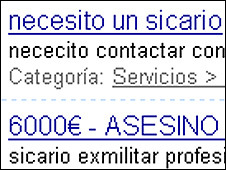 In one of them, a person describing himself as an ex-military killer offers "discreet, professional services" for $6,000 (£3,000). Hired killers are a problem across a country which has seen at least 1,400 killings this year. Most of the killings are related to drug cartels battling for control of the illegal drugs trade to the US. Reports say the cartels have camps to train killers. The dead include dealers and gunmen as well as more than 400 police officers and other public officials, this year. Some 25,000 troops are now deployed around Mexico to try to break the cartels. But correspondents say an ineffective justice system means many killers are never caught. That may be why they are prepared to publically look for work. In the online adverts on one classified site, one advert reads: "Assassin ex-military professional and discreet. Work guaranteed in 10 days or less. Have worked in Spain. $6,000. Serious requests only" and gives a hotmail address as a contact. Another offering "hitman for hire" asks: "Problems with a certain person? Do you want me to solve it? Write to me. 100% professional, we don't take money in advance." The classified ads site also appears to be a place where those needing the services of a killer might go. One advert in the Wanted section reads: "I need to contact a killer for a probable contract in the DF (Federal District of Mexico) must be reliable. it is a simple job." Police spokesman Miguel Amelio said the problem of hitmen is one that "the whole country is facing: people who offer their service and charge for killing someone". He told the Reforma newspaper that police had not ruled out the fact that the ads were fake, but all were being investigated.